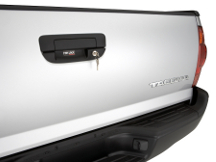 The Pop & Lock Tailgate Locks will not only keep your tailgate from ever being stolen but also the valuable gear you put in your trucks bed. Pop & Lock keeps your trucks tailgate handle from being pulled to the opened position. Fits securely under your trucks tailgate handle and designed to fit your specific truck application. Forged from extra-strength armored steel, Pop & Lock is offered in manual or power operated locks. No drilling or cutting needed for installation.